Made by Grunman Aircraft Engineering Corporation in Long Island, New York, United States of America, 1968. A model of the lunar module (also known as the lunar lander) which was part of the Apollo 9 spacecraft. The model is made of metal and plastic and has been fixed to a circular plastic mount. Green felt covers the underside of the mount. The module consists of two stages, the ascent stage which forms the top half of the model and the descent stage which forms the bottom half of the model. Both the ascent and descent stages a have been painted beige. The American flag appears toward the front of the descent stage. Antenna and radar receivers on top of the module are reprsented by plastic dishes and pieces of wire. The model sits on four metal legs that have been painted silver. Attached to the bottom of each leg is a metal dish. The leg at the front of the model has a ladder down its length. Black text on the model below the American flag reads 'UNITED STATES'. 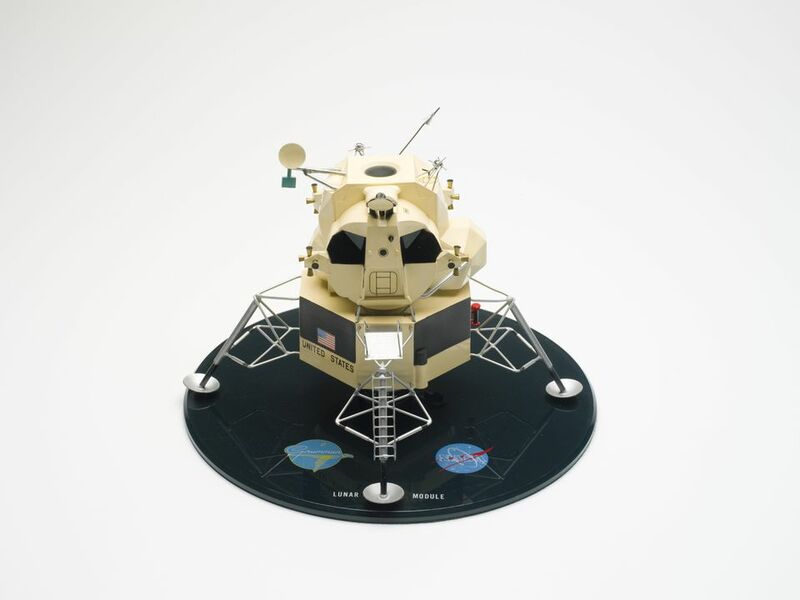 On the models mount, below the logos of 'Grunman' and 'NASA' is white text that reads 'LUNAR MODULE'.